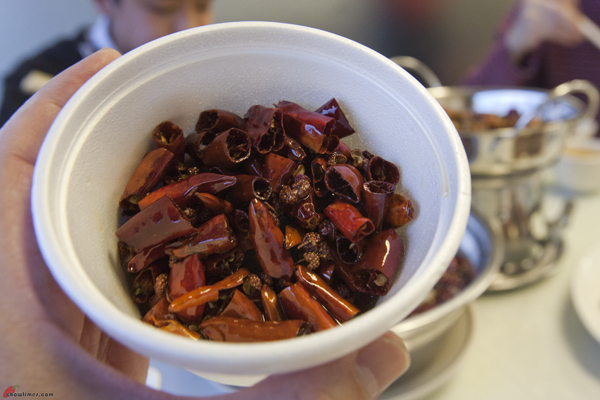 This is a new Sichuan restaurant just opened in Richmond. In my world, this location is unique. To me this location is an restaurant incubator of sorts. Over the years, this location had spawned off many successful restaurants. Just to name a few, this location is where the Danny’s Wun Tun, Chen’s Shanghai, Shanghai Wonderful and Shanghai River had their early humbler days. At the same mention, this location is also the site of two unsuccessful restaurants for the past two years or so. Firstly, it was Da Hong Yun and then a month ago, Shanghai JJ also closed. We noticed that the Shanghai JJ signboard was no longer there when we drove by in the morning of March 20th. 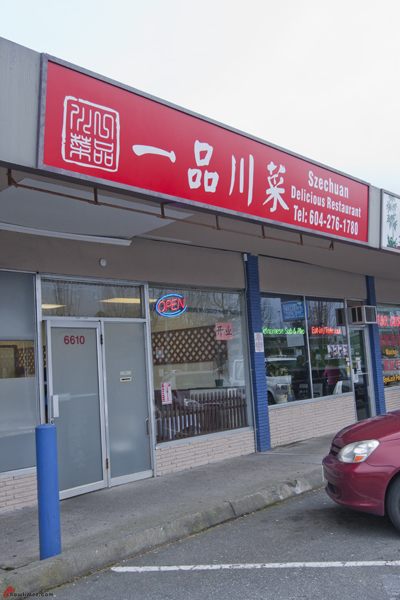 In its place is a new signboard that says Szechuan Delicious Restaurant. So we planned to have dinner there since we like Sichuan restaurant and we did not want to go back again and again to our favourite Sichuan restaurants and not blog about it. Yeah, I can’t think of any Sichuan restaurants that we had never visited yet. I think there are but I can’t think of any. Any idea? You can click on the Sichuan category on the side panel to view all the Sichuan restaurants we had blogged about. The place looked … the same. No frills and all. I checked the interiors photos of previous restaurants. Seems like the it’s basically the same. The same table arrangements and the chairs are still the same (although it had a new coat of paint). Two big round tables, five small round tables and three rectangle tables. The place seats 50 people max. The restaurant was about 3/4 full on that day. Most came in when we were almost about to leave. 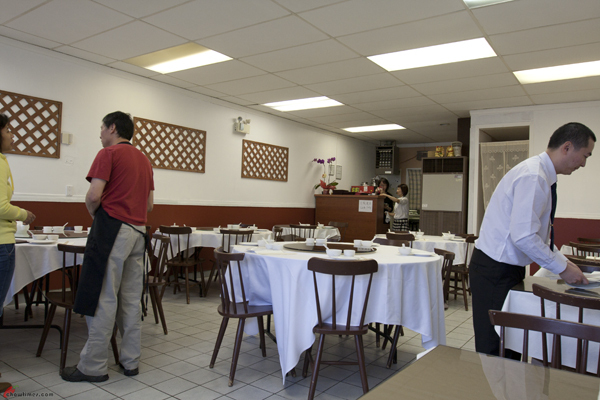 However, we did notice that most of their customers were their friends as the restaurant workers were chatting with the customers and greeted them warmly. Service was good and eager. It is just as expected specially since it’s their opening day and all. We inquired and were told this restaurant is under a new owner and management and have nothing to do with the previous Shanghai JJ restaurants. The waitress who served us speaks Mandarin and she spoke a little Cantonese and English. So it was a bit difficult ordering. As we looked over the menu, we decided to concentrate our order on the Chef Recommendation page on the menu. However, that page was all in Chinese only. 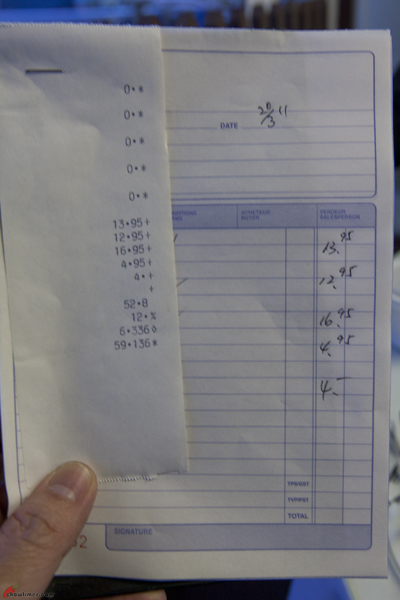 So, we asked the waitress to translate the dishes. She was patient with us as we made her read each one and we figure out what she was saying. One thing we noticed on the menu is that there is no chili logo to indicate how spicy the dishes are. 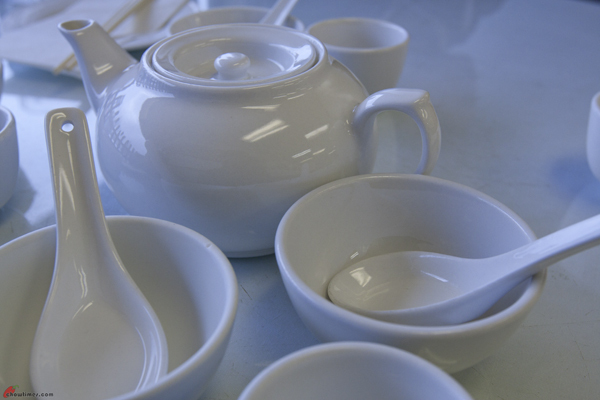 So, you need to know what the dishes are before you order. 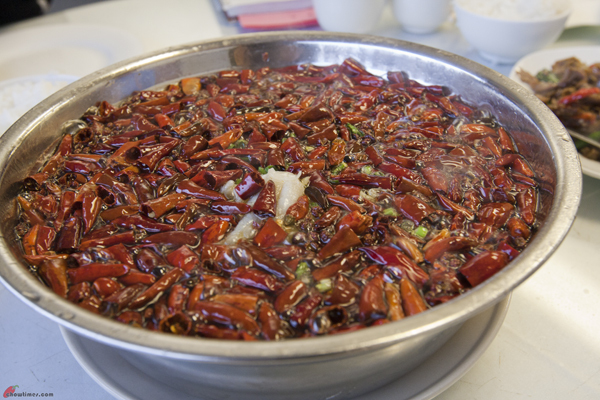 As you know, Sichuan cooking is all about “ma-la” (numbing and spicy hot). Other than the fixtures and furnitures, their plating and cutleries were new. He he he … some of the things were not broken in yet (see above … took them a while to light the burner). We order four dishes for the four of us in the family. We should have ordered three dishes instead of four as we know it is too much food. We got four because we just couldn’t resist ordering anything less. I wished we had more people to tell the truth. The first dish is the Stir Fried White Chili and Chicken Gizzard ($12.00). The reason why this is appealing to us is the words “white chili” and “gizard”. I remember encountering white chili for the first time about 1-2 years ago in Luckynoodle where I had enjoyed this. If I am not mistaken, I also had this in Alvin Garden too. Besides the white chili, it also has red chili and green onions which i thought complemented this well. It is an extremely spicy dish. Arkensen said that his tongue got torched. He took a couple of bite and then stopped touching this altogether. 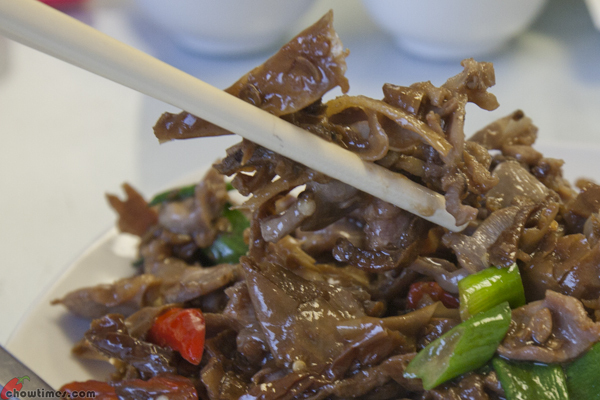 We like the Chicken gizzard which has a very crunchy texture. This is what the white Chili looked like. It looked like it is camouflaged in the rest of the dish. So you might accidentally pick it up if you are not careful. Me? I eat them but I ended up with plumbing problems the next day. I knew it would happen but I just can’t resists it. The Boiled Slice Fish with Chili Oil ($17.00) was rather expensive. It is also listed under the chef recommendation. It came served bubbling hot as you can see above. It boiled a lot more when it was brought to the table. By the time I got the flip out to record it, it was not as bubbling anymore. 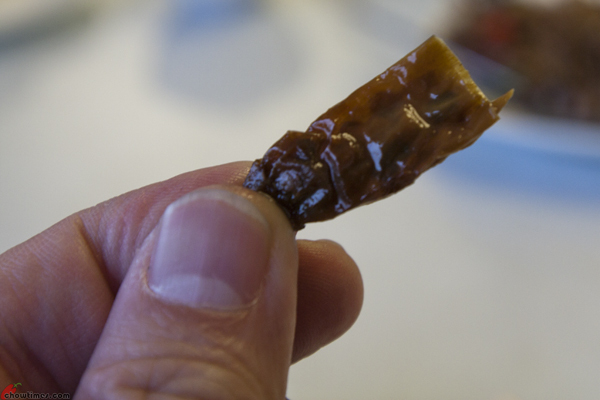 … but still leaving quite a bit of chili left in the pot. 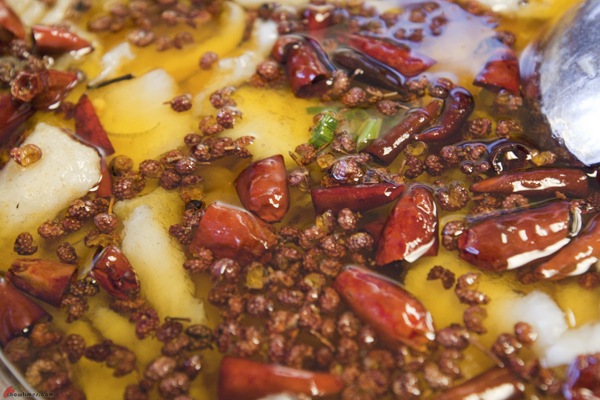 What is more important is the Sichuan peppercorns which gives the numbing effect! The oily jhup too was what I like a lot with the rice. There are quite a lot of fish too but it’s not an entire pot of fish. Right below the layer of fish is a bed of soy bean sprout. Nanzaro asked the waitress to have some of those chili to take home. Yeah, he wants this to make his own fried rice. You know, Nanzaro makes fried rice almost every night as his supper before he goes to bed? He is a growing boy. When I was his age I had the same appetite too. His ko-ko (elder brother) likes to annoy him by asking for a bite of his fried rice. So was Nanzaro’s fried rice good? Nope, not at all. Suanne’s fried rice tasted much better. Nanzaro being a stubborn person refuse to learn Suanne’s recipe. The third dish we had was also under the Chef Recommendation page — the Pork Intestine in Hot Pot, $14.00. 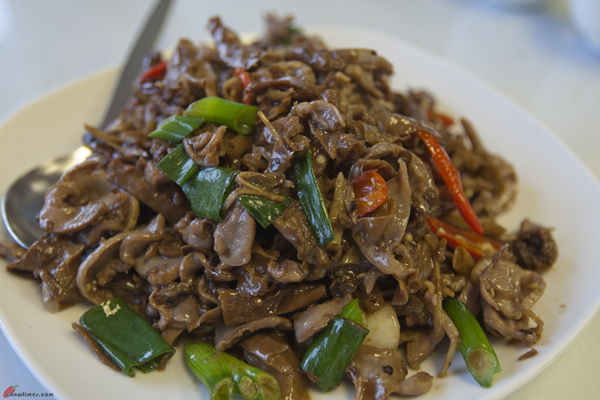 It has lots of vegetables like celery, bamboo shoot, lotus root and wood ear which gives the unique crunchiness to this dish. It was a bit salty and what we did not like was that there are not much intestines in this pot. Anyway, we were surprised that Arkensen loves the intestine even though he does not like spicy food a lot. The reason we are surprised is that he keeps on telling us he is white washed and he declared that he don’t like Chinese dishes. 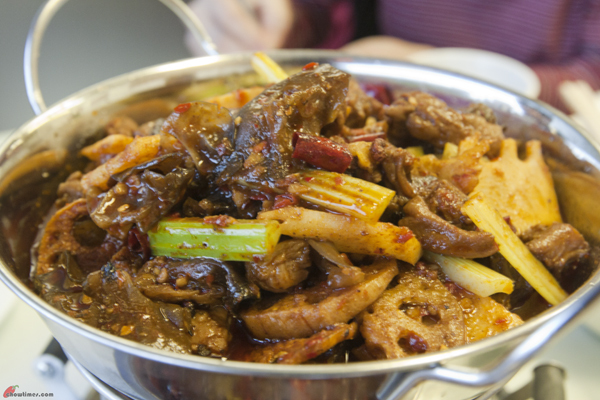 This dish is very traditionally Chinese which is not something the general public would order. We also had the Cold Noodle in Sesame Butter Sauce. It is cheap. Just $5.00. Before we ordered this, we asked Nanzaro and Arkensen two questions. “Do you like noodle?” and “Do you like peanut butter?”. They said “Yes” to both question. And so we said they will like this dish we are ordering. Maybe I should say they are SUPPOSED to like this dish we are ordering. Turns out that they did not quite like the combination. 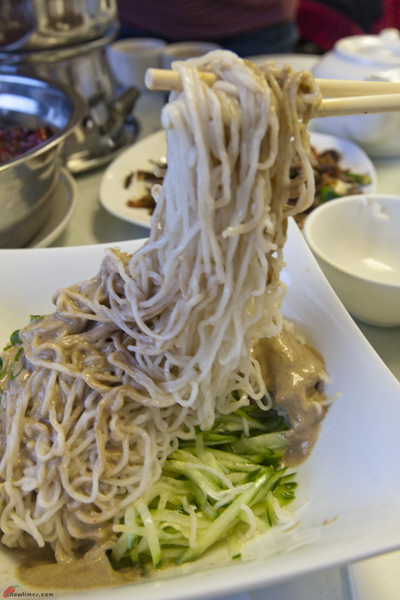 This cold noodle dish was served at the end of our meal to cool down our tongue after all the spicy dishes above. 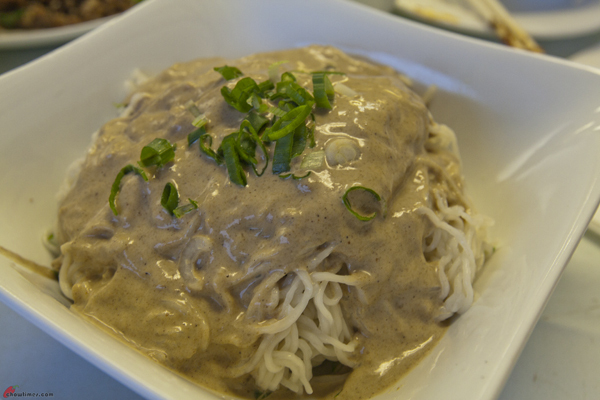 The Cold Noodle in Sesame Butter Sauce was served on a bed of julienne cucumbers. This restaurant accepts cash only. Total damage was $60 before tips. So it was a tiny bit on the high side. Am saying this considering how basic the decor was and such. Anyway, we like the dishes we ordered. Actually come to think of it, $60.00 is not that expensive considering we had LOTS of leftovers to take home. Does this place have lunch special? When I had it in China it came in a huge metal wok hehehe Thank you I am fine 🙂 just need to rest up a little! All that chilli and pepper corns, can you taste anything after that burn? 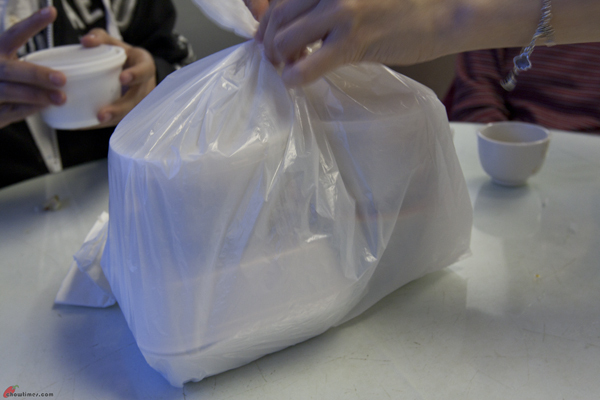 Was that cold dish Bon Bon Chicken a well known Szechuan cold noodle dish?